It was our last day in Nepal. We were spending it in Kathmandu trying to fit in some last minute sightseeing while running errands for the journey ahead. We were headed east to Tibet, the Land of Snows. We gussied up for a last night out on the town. Just before heading out the door of our hotel, however, the front desk clerk suggested we rethink our evening plans. “Nepal is closed tomorrow,” we were told in his broken, British-accented English. As the doorman put a padlock on the front door and drew the shades of our cheery hotel, we soon learned we were on the eve of a massive political protest in Nepal. Maoist rebels were set to take over the cities the following day, shutting down businesses and shops and putting a halt on all taxis and buses. 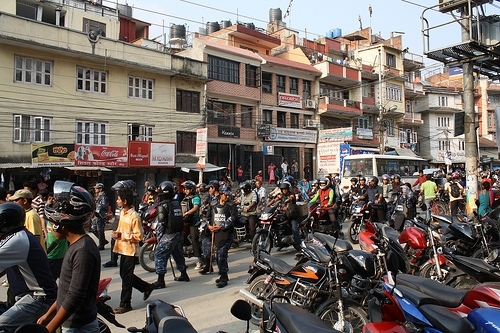 The last time a protest of this magnitude took place, Nepal was ‘closed’ for nineteen days. We opted to have dinner in that night, but our plans to depart for Tibet the following day wouldn’t change. An early departure ensured we would make it out okay so at 3:30 a.m., in the stillness of the morning and the calm before the Maoist storm, we were picked up in a bus barreling towards Tibet. The early morning drive was beautiful. We snaked around the valley of the Himalayan Mountains hugging a river gorge while passing through Nepali villages. Three hours later we arrived at the border town and sat down to a breakfast with the other travelers who’d be joining us on our adventure. It was here we learned we’d be in good company for our eight-day journey in Tibet. Never have I met a more well-traveled and diverse group of people. From Botswana to Croatia, from Chile to Malawi and every place in between, these travelers came from nearly every corner of the globe. Prior to approaching the border, we were briefed by our guide on what to anticipate. 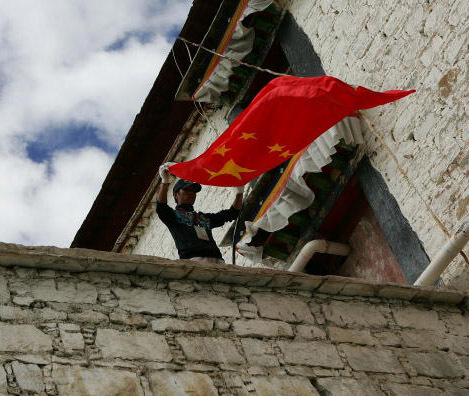 As expected, we weren’t to bring in any ‘Free Tibet’ apparel or Tibetan flags. But our guide extended the off-limits list. Any books or magazines criticizing China, any photos of the Dalai Lama, and god forbid, any China Lonely Planet guidebooks were out. The latter, we were told, is forbidden because they show Taiwan to be separate from China on the guidebook’s map. We were getting a taste of the absurd control and hypocrisy of the Chinese machine. We said adieu to Nepal and were directed to begin the border crossing procedures, a process that would take a good part of our day. We crossed a huge bridge lined with Chinese soldiers carrying guns as tall as they were. At the end of the bridge were massive columns where more Chinese soldiers stood in permanent salute position under the enormous Chinese red flag flapping in the wind. It was a surreal experience. We were about to enter Tibet, a land I’ve read so much about and dreamed of seeing. What I found were the Chinese standing tall, proudly making their statement. There was no Tibet. We were entering China. My first glimpse of the Tibetan people was here at the border. They were slumped over at the waist hauling forty plus boxes tied together with ropes on their backs across the border. Beside the Chinese in their finely pressed uniforms, the Tibetans were dressed in ragged clothing. They looked exhausted and beaten down. They were working like mules. We began the inspection procedures at the Chinese immiration office. The thorough search of everyone’s belongings lasted all day. They searched through toiletries and clothing. They thumbed through books and magazines, and confiscated items they viewed as a threat. They tried to take away our CD of Enya-like Tibetan Buddhist chants we had purchased, and by the time the search was over they’d taken heaps of guidebooks away from our traveling cohorts. The aggression and intensity of the search was invasive, and made us feel like we were losing our personal freedoms. Things I’ve taken for granted my whole life, like the freedom to choose what I read and what I wear, were taken away. It made me feel very uncomfortable and even a bit nervous. China was flexing her muscle and would remind us daily during our stay in Tibet that Big Brother is watching. They say first impressions are often the truest. Well, when a photo of the fallen leader of Tibet or an inaccurate map of China pose such a threat, the Chinese seemed, to me, more petulant children than fierce rulers. With this in mind, I reluctantly entered China’s Tibet. .-= Kristina´s last blog ..// foto focus // street art in istanbul =-.